The Book of Job is a well-known Old Testament Bible story of a wealthy man without worldly cares who simultaneously suffers catastrophic calamity including the loss of his children, wealth, and health. It’s actually a pretty depressing story that serves to answer the great question in life: Why do bad things happen to good people? While the tragic story of horrific disasters hitting Job and his family are laid out in the first 2 chapters, the actual hashing out and debating of the question at hand are conducted by Job and his well-meaning but grossly incorrect friends over the next 29 chapters of this 42 chapter book. I would speculate that most people don’t read past Chapter 2, perhaps Chapter 3. Beyond that are long and tedious chapters rich in poetic human rationale. Unfortunately, the answer doesn’t really knock us to our knees until Chapters 32-37 when a wise young man enters the discussion, and then Chapter 38 when God finally weighs in and ends the debate. While the Book of Job reads like a master’s epic literary poem, it is a historical poem describing real events which took place in the time of the Biblical patriarchs – Abraham, Isaac, Jacob and Joseph. 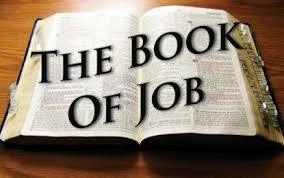 In fact, the Book of Job is considered to be one of the greatest literary works of all time. The great English poet laureate Alfred Lord Tennyson called it “the greatest poem of ancient and modern times.” It’s the type of work that one would have to read in high school and college. I did have to read it in public high school in a Literature course taught by my favorite teacher. He was an atheist but taught the Book of Job as an example of great literature written at the time of King Solomon. I didn’t really understand it as naive high school Christian at the time. The book then was very boring to me and seemingly over my head. Opening (Chapters 1 and 2) – Job is introduced as a pious and wealthy man. At the prompting of Satan, the Lord God agrees to test Job. He allows devastation by Satan on Job’s life, other than Job’s physical death. Job therefore loses children, wealth, and health. His own wife tells him to “Curse God and die.” Three friends (Eliphaz, Bildad, and Zophar) come to comfort him. Discussions with Friends (Chapters 3-31) – While Job’s friends are kind and supportive in visiting, weeping and commiserating with him, after remaining silent with him for 7 days they then wax eloquent in a series of speeches that reveal their own human rationale for Job’s suffering. Job debates with Eliphaz (Chapters 3-7) – Eliphaz accuses Job of guilt, that only the wicked suffer, that Job should confess his sin and trust the mercy of God. His approach is philosophical. Job asks for pity and declares he has done no wrong. Job debates with Bildad (Chapters 8-10) – Bildaz accuses Job of hypocrisy, that “God will not reject a blameless man,” that Job must have committed some sin; that there must have been some unspoken sin. His approach is logical. Job refutes the charge and seeks God’s relief. Job debates with Zophar (Chapters 11-14) – Zophar condemns Job as a liar and hypocrite, that his poor plight is the just consequence of his sins. His approach is practical. Job insists he knows of God’s all-encompassing power and of his own innocence. He expresses resentment of his friends and confusion over God’s treatment of him. Eliphaz turns hostile with Job (Chapters 15-17) – Eliphaz begins a second round of speeches with a more angry tone of accusations and rebukes. He is angry that Job will not accept his friends’ counsel. Job calls his friends “miserable comforters” acting more like enemies who professed to be friends. He concludes that though he is innocent, God must be angry with him. Eliphaz and Bildad continue accusations of Job (Chapters 22-31) – In a third round of speeches, Eliphaz and Bildad continue their criticism of Job and call for his need for repentance. Job counters with insistence on his innocence and his commitment to God. Elihu enters the discussion (Chapters 32-37) – Now Elihu, a younger man, joins the debate out of frustration with all parties, including Job. He rebukes the friends as well as Job. He rightly claims that: 1) God is not unaware or apart from our pain, 2) God is not unjust, He deals with the wicked, 3) God is great and inscrutable, none of us can compare, and 4) God is Almighty, fear Him, don’t question Him.1 There is no counter response from Job to Elihu. God speaks to Job (Chapter 38-41) – Finally, God speaks and Job is humbled. God overwhelms Job by reminding him that He is God, and Job is not through a series of profound questions which underscore God’s infinite greatness of creation and man’s ignorance and finiteness. Yes, the Book of Job is steeped in men’s answers and explanations to the big question posed by everyone at some point: Why does God allow bad things to happen to good people? Starting in Chapter 32, I believe Elihu speaks the inspired word of God in addressing this question for Job and his friends: God is glorified, in and aware of all things, good, just, great, beyond mere man, to be feared and revered, and not to be questioned, though we may try. Then in Chapter 38, God weighs in and puts his final say on the matter with a perspective that reveals that His purpose is bigger than ours. With humility, wonder, and awe we can learn and accept the heart, love, power, and dominion of our Almighty God. Do you understand the full story of Job? 1 Peter Krol, Why Elihu is So Mysterious, knowableword.com, 7/24/15.